The 251 progression is the most common progression in jazz. Most jazz standards and lead sheets that you come across will contain a 251 progression in some form so it is essential that you know how to construct and play the 251. 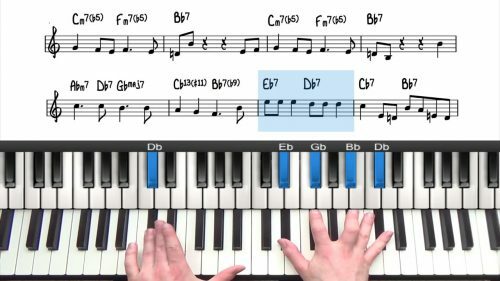 In this lesson we discuss the basics of the progression and what to look out for to identify 251s on lead sheets and jazz standards. You will also come across incomplete 251s which are known as 25s. Being able to spot 25s and 251s will greatly improve your ability to pick up and play a lead sheet. You need to be able to visualise this progression with the 3rd on the bottom and the 7th on the bottom. We cover both of these starting positions in the lesson. Once you are comfortable with the major 251, you can then move onto the rootless major 251 progression and the minor 251. 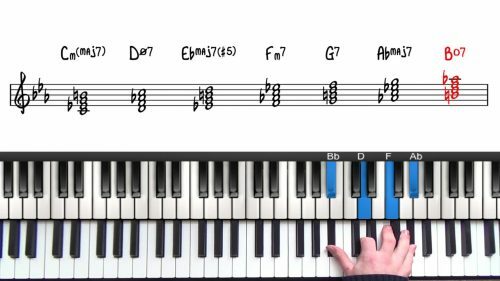 These 2 progressions are more challenging and you can watch these tutorials in the course on Left Hand Voicings. Learning and memorising the major 251 progression is an important step in learning jazz harmony. You need to be able to visualise the voice leading of b7s falling to 3rds, in both Type A and Type B starting positions. Try to play the major 251s every time you sit down to practice until you can play them in all 12 keys without mistakes. When practicing, don't always start with C Major. Mix up the key you start in to make sure you are familiar with all 12. Check out the PDF practice plan for this course and use it to structure your practice sessions.